Curiosity killed the… wait, what? 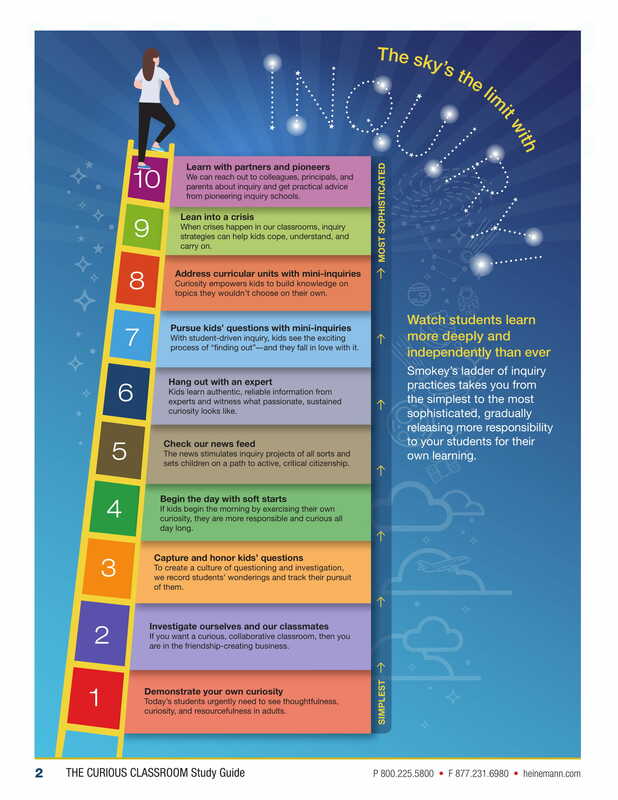 The Curious Classroom by Harvey Daniels (2017), aptly subtitled 10 Structures for Teaching with Student-Directed Inquiry, is one of those professional books you can read on the beach, in a busy airport, on the train, or anywhere else, really. It’s practical and conversational, with plenty of real-life examples, photographs of classrooms, and handy sketchnotes at the end of each chapter. 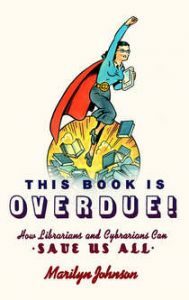 Read this book: If you are a lower or middle school librarian looking to boost curiosity and wonder at your school, wanting to let students take control and run with their own interests and ideas rather than focusing on the same old research project (is it birds this year? or animals in general? ), grab a friendly and collaborative teacher partner and read this book together! This study guide will be gold as you’re reading together. Idea: Why don’t I have a Wonder Wall in the library (Google it with a -oasis unless you’d rather listen to the song…)?! The setup is easy — a blank bulletin board with the words “Wonder Wall” and sticky notes or slips of paper for students to tack on. That’s such a simple way to validate and explore students’ questions! Idea: I feel similarly about Genius Hour — this seems like old news, but I’ve finally found a way to make it work in our lower school library. We have scheduled time throughout the year for Friday afternoon classes that generally last three weeks called Interest Groups. I’ve led Library Helpers, Finger Knitting, Book Budgets, and a variety of other crafty and library-related groups, but I’ve never tried a Genius Hour. And this would be PERFECT for this structured time because students can choose to be in the group and spend their afternoons exploring and researching anything they wanted to! I love having small group research help time and feel like this would be such a natural way to support students. With inquiry projects we sometimes spend too much time setting things up. And if we slow down too much, kids can lose energy and start complaining. 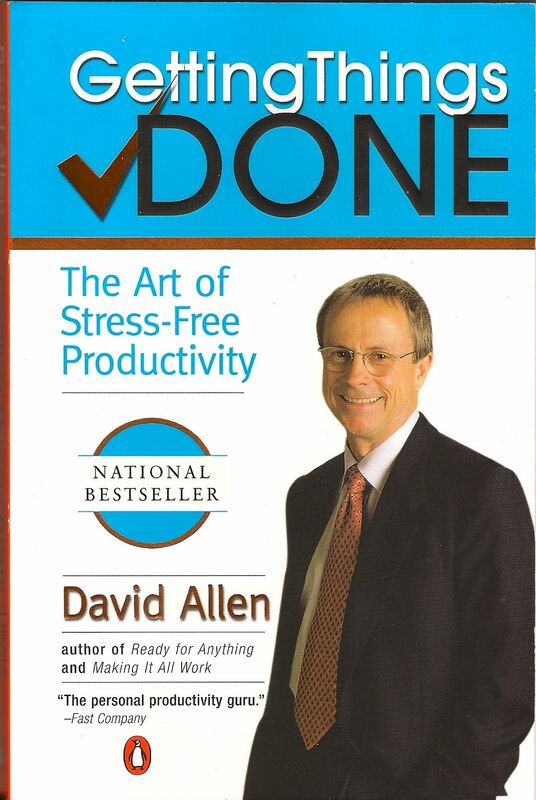 Though the example in the book seemed entirely too-smooth-to-be-true (in less than 5 minutes, students wrote down what they already know about the topic and questions they have), I know that one of my growing edges is to let go of some control and let kids start the work without so much frontloading. They’re going to stumble and make mistakes and get frustrated, and that’s okay! That’s real life! The real struggle that I have been having with this kind of open, student-directed inquiry, especially for my young students, is that their interests are SO MUCH more complex than the texts written for them. Their questions are just not easily answered in a book at their reading level. So, we talk a lot about the research process, about the kinds of sources we have available to us and about which one would give us the best answer. We document our research process, noting the hard parts, and work towards making meaning of the information we find. 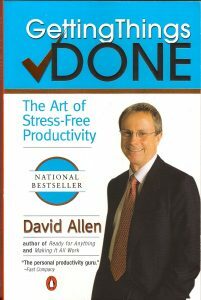 This book validated that process for me, assuring me that it is, in fact, messy work, and if it’s not, then we’re not doing it right! Dear Twitter friends, You make me better. A few nights ago, I was stuck with some serious insomnia. I know I shouldn’t have my phone on in bed, especially if I can’t sleep, but I have a nervous twitch that makes me check my email/Facebook/Instagram/Twitter on a continuous loop throughout the day. (This is me admitting I have a problem.) So, here I was at 2am, scrolling through what I missed on Twitter that day, and I discovered a few of my new friends were participating in a #g2great chat. I had no idea what that was, but from their responses, it looked right up my alley! 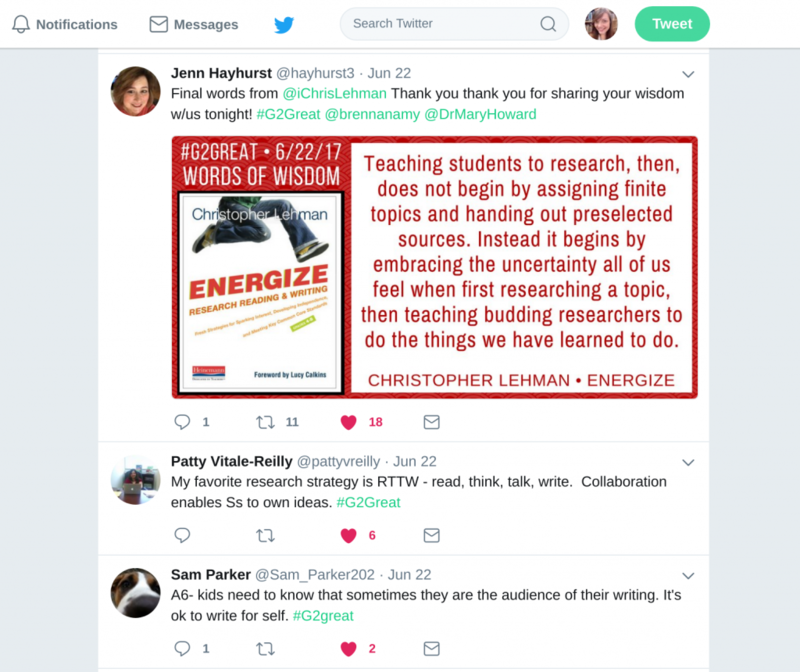 It turned out that author Chris Lehman was guest hosting this chat, using his book ENERGIZE Research Reading & Writing as the catalyst for discussion. Goodness me, the discussion was so good that I ordered myself a copy of the book right then and wondered why I hadn’t heard of it before! 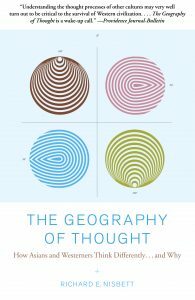 I had so many ideas of how to turn research right on its head in our 3rd/4th grade classes next year — from throwing out note-taking uniformity to promoting student choice in topics (yeah, we’re still not there yet…) to explicitly teaching students to THINK about their nonfiction reading (an ongoing struggle). 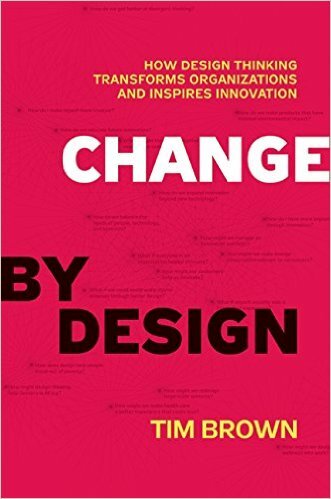 I AM energized, and I can’t wait to dig into this book! Thank you, Twitter! But I do have to wait. 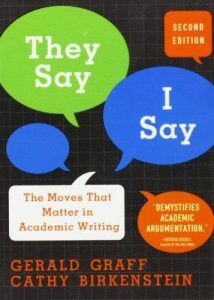 See, a couple months ago, some Twitter friends were going bananas over Disrupting Thinking: Why HOW We Read Matters by Kylene Beers and Robert E Probst. 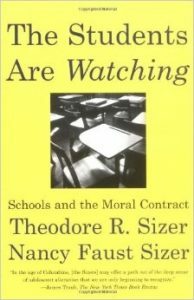 This was along the same time I was taking the Visible Thinking class by Project Zero, so there was a bit of overlap between folks reading and doing both. Over and over again, I would see book quotes and sketch notes and exclamations of genius and adoration for this book. 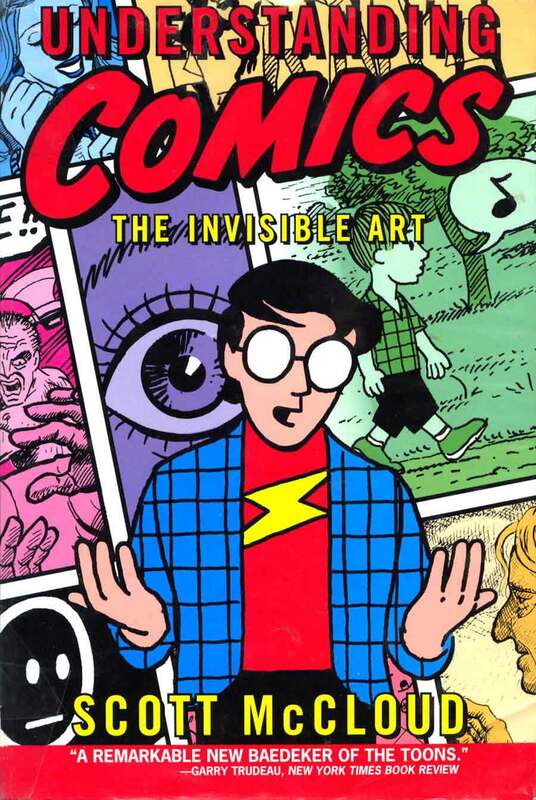 So, I shared a stack of professional books at our last staff meeting, highlighting this one, saying that it was at the top of my to-read pile and hey, would anyone like to join me? Crickets. 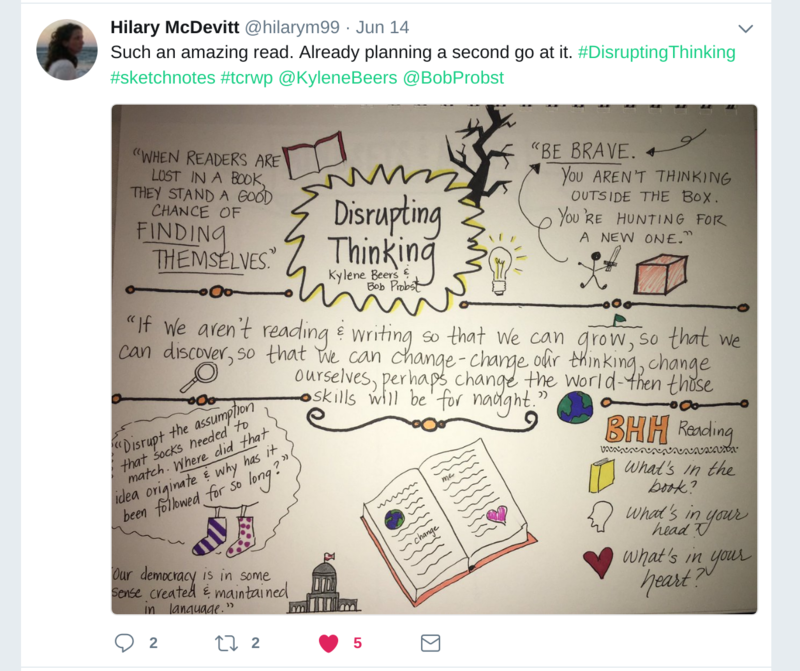 But a few days later, a teacher asked me if I wanted to do a summer book club with Disrupting Thinking — woo! We had our first meeting today, just three of us crazy teachers working on summer break, and it was great. Our conversations flowed from the topics in the book (we read the first third and will meet again two more times) to our own practice to possibilities for the future. I only wish we had taken notes! But again, thank you, Twitter friends, for inspiring this connection and growth opportunity. There are definitely times when I need to unplug and just be. And there are times when it is so hard to be in a constantly evolving community, especially when I’m running low on time, energy, or effort. But when I’m up for it, when I want to be inspired or challenged, I turn to my carefully curated community of teachers and librarians on Twitter because I know that they’ll make me better. I hope I do the same every now and then! 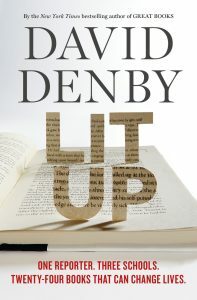 New Yorker writer David Denby has written a quite remarkable book on reading, how English is taught in high schools, and how teenagers in the 21st century interact with literature and poetry. 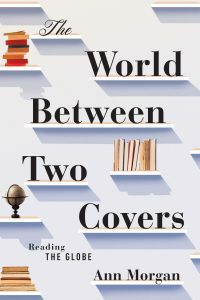 Set over the course of a school year, the book investigates teenagers and their relationships with screens, how teachers engage and inspire youth, and what teens are reading versus what they should be reading. 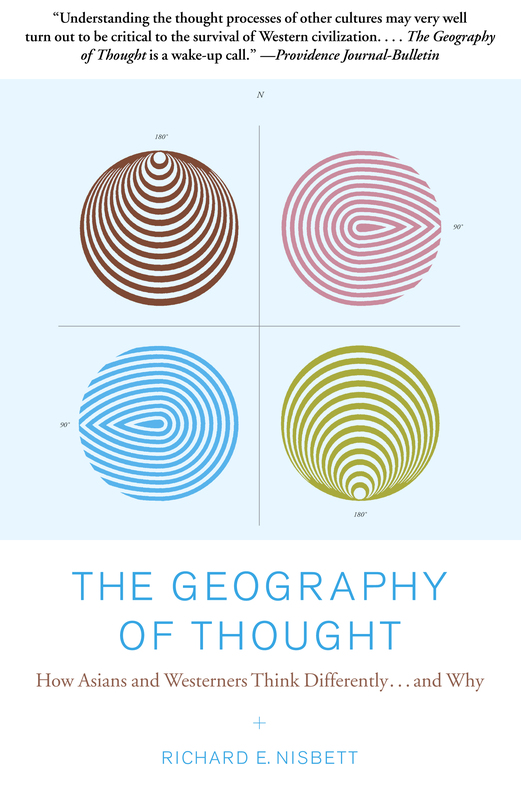 The book also inspired an article in the New Yorker – even if you don’t have time to read the full book, take five minutes to read this interesting article. 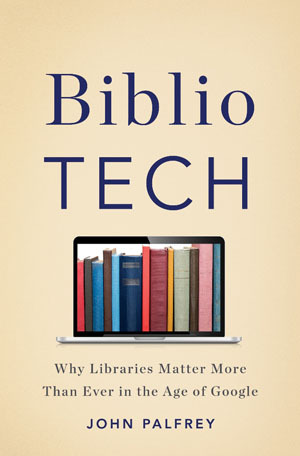 Although we no longer have a reference section in my library (reference works are simply interfiled with other non-fiction materials), I frequently consult the reference works we do have both in print and online, because, well, ‘that’s what librarians do’. 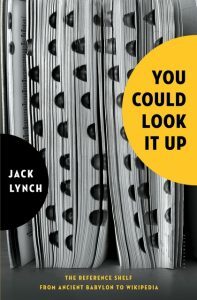 This fascinating book by Jack Lynch takes a look at key reference works from the Doomsday Book to Samuel Johnson’s Dictionary, as well as some of the more unusual reference works that librarians refer to again and again. 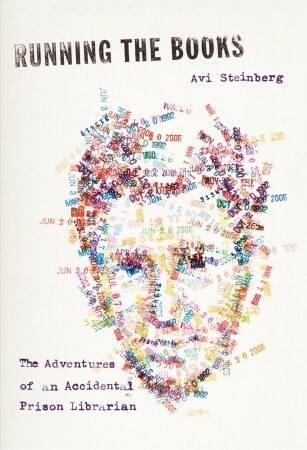 This interesting memoir was inspired by Morgan’s blog: A Year of Reading the World. She decided to read one book from each country around the globe during 2012, setting out to discover new and interesting authors and poets. 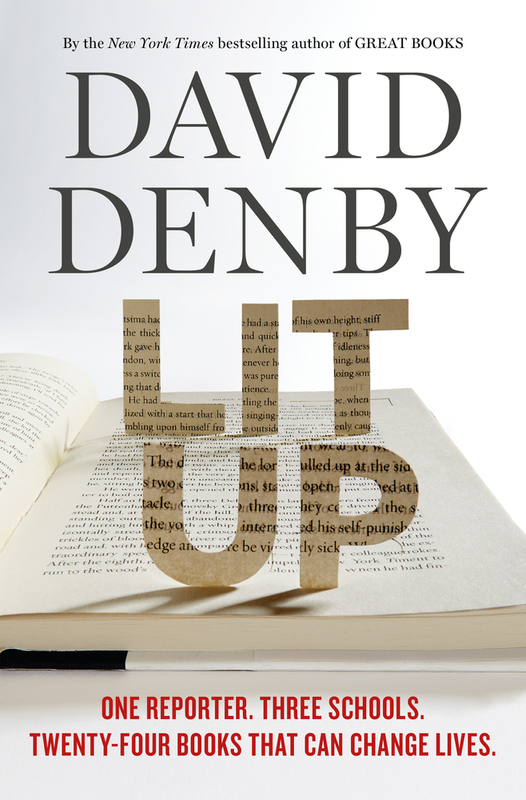 Her book is a great record of her reading life, but be warned – it will seriously add to your (probably already towering) To-Be-Read pile. It takes a special kind of librarian to run programs for those who are incarcerated. In this fascinating memoir, Steinberg shares his story of being the librarian in a Boston prison. 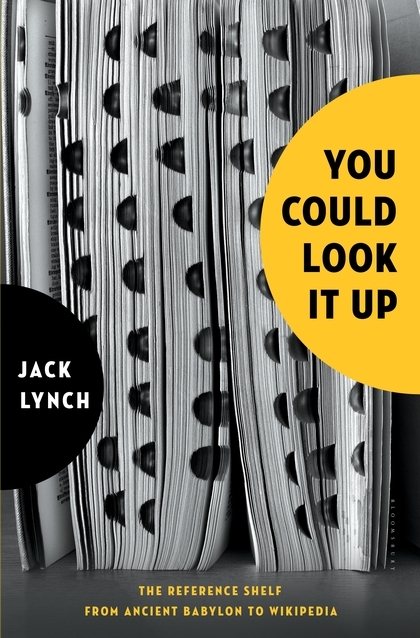 From the inmates he helps complete their high school and college diplomas, to the men who are trying to write their memoirs, to the inmate who wants to pitch a cooking show to a TV network, this book is in-depth look at life in a very different type of library. 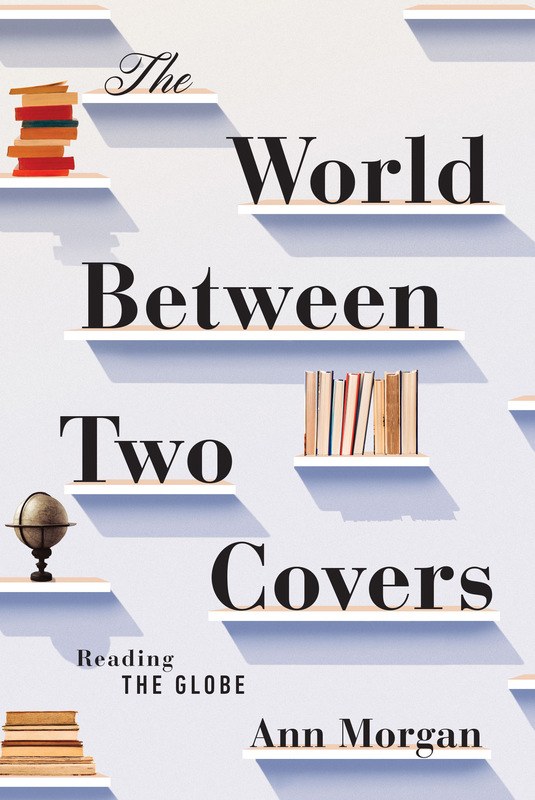 Author John Palfrey makes the point that libraries are more important than ever, and that they must step up to bring equality, intellectual freedom and democracy to ordinary people. 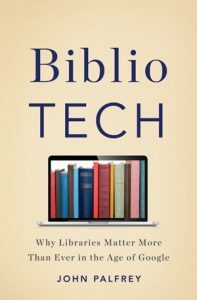 Referring particularly to the digitization of materials, Palfrey discusses why libraries must be cutting edge in meeting the information needs of the population, especially when “the library is the last free space for the gathering and sharing of knowledge”. None of this is new to librarians, but this slim volume is written in an engaging and passionate style that calls librarians across the world to action. 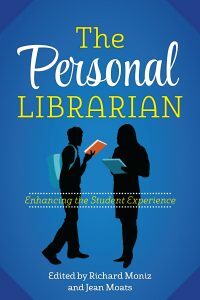 This book is an excellent collection of classroom and library-ready ideas for librarians and teachers who are looking to help their students enjoy, reflect on, and get as much out of reading as possible. With lesson ideas, journal prompts and ideas for how to make the most of leisure reading and ideas for finding the right novel for the right reader, this book is full of inspiring ideas and activities, even for those of us who have been around for a while and have our own proven methods for getting the right book to the right student, and for raising excitement amongst our readers. So, if you’re inspired to pick up some professional reading, why not join a group of fellow librarians online to do so? 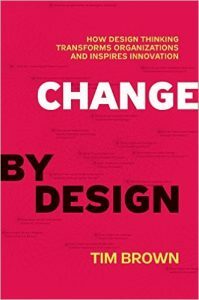 AISL librarian Dave Wee is running an online book club to discuss Change by Design by Tim Brown, a book about Design Thinking which is the AISL Summer Institute’s recommended pre-reading selection. Head on over to his website if you’re interested in reading along! And if you weren’t at the Board Books event at #AISL16LA, consider reading one or both of the following. Each generated lots of discussion! 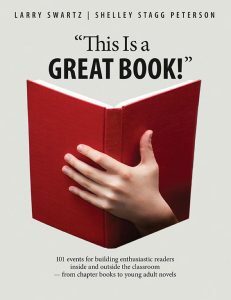 Do you have any similar titles to recommend? Please share in the comments below!